A lot of researchers are thinking about how to genetically engineer crops and food animals to help them withstand post-climate change heat and parched conditions. But what about genetically engineering humans to slow our constant carbon contributions? In 2012 a philosopher named Matthew Liao co-authored a paper that proposed altering human biology to combat climate change. In the paper, Liao and his colleagues propose a number of possible changes to human biology to help us combat climate change. When the paper came out, it got a lot of attention. Some people thought that Liao and his colleagues were trolling the academic community or that it was some sort of early April Fools joke. Bill McKibbon, a prominent environmental advocate Tweeted that the suggestions in the paper were the “worst climate change solutions of all time.” And, of course, climate skeptics thought it was totally insane to alter human genetics in response to a problem they do not believe in. Here on Meanwhile in the Future, however, we are all about taking on specific future possibilities. So I decided to go through the suggestions in the paper and figure out if they would work. To help sort through whether or not these changes are possible, I called Amy Maxmen. Maxmen recently wrote a cover-story for Wired magazine about CRISPR, the new gene editing technique that has a lot of people talking about the crazy future possibilities for genetic engineering. 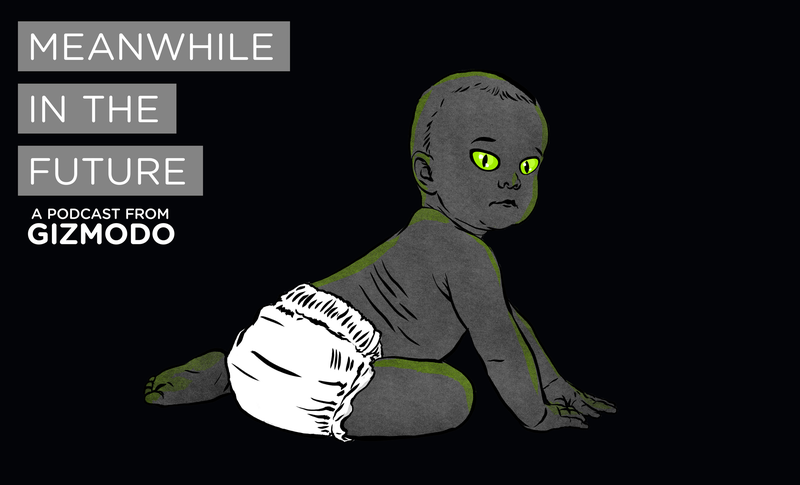 The first proposal we cover is night vision — the idea that we could genetically engineer humans to have more rods so we could better see at night, and thus reduce our dependence on electric lights. The problem here is that there are only so many spots for rods and cones in our eyeballs, and our particular balance of the two is a tradeoff. Humans are day creatures, so they have more cone cells. Animals like cats are night creatures, so they have more rods. So during the day, humans can actually see motion about 10 to 12 times better than a cat. And many experts think that cats don’t see the same number of colors we do, although they’re divided over whether cats see in mostly blues and grays, or whether they see more like dogs where everything is less saturated. So if we want night vision, we might have to compromise some of our day vision to get it. Another modification that Liao proposed was an induced allergy to meat, to help people reduce their consumption of animals. According to the Food and Agriculture Organization of the United States 14.5% of all greenhouse gas pollution comes from livestock. So the idea here is to make people allergic to eating meat. The problem is that there’s no real way to control the severity of the allergy, and the two proteins that Liao talks about targeting (BSA and alpha-gal) are both found in all kinds of places like milk, eggs, dogs, cats and pork. People allergic to alpha-gal seem to be able to eat poultry and fish, but if they were to eat pork or lamb or beef the allergic reaction includes everything from hives to gastrointestinal upset, to anaphylactic shock. Not something most people would want to sign up for. Next we talk about breeding people to be shorter, something Liao says could reduce our carbon footprint. Smaller people require less energy and use fewer resources, Liao argues. But selecting for height genetically would be a nightmare, according to the most recent paper that Maxmen found there are 697 genes involved in height. Since there’s not a good way to select for height genetically, another method Liao talks about in his paper is using treatments that cause babies to be born light — to have a low “birth weight.” But that comes with a set of very real dangers to the baby, and few mothers would opt to take that risk. Not to mention set their kid up for society’s bias against people (particularly men) who are shorter. But what about less physical ways of decreasing someone’s impact on the climate? The next method Liao talks about is using cognitive enhancement to decrease the number of babies each person has. He proposes giving people access to things like Ritalin and Modafinil to increase their cognitive ability because there are some links between cognitive ability and having fewer children. The problem is that some of the most robust connections between those two are caused by unequal access to education, healthcare and economic opportunity. Giving someone Modafinil won’t give them access to an education or a place to live or access to contraception. And if we zoom out for a second and look around our world, do we truly think that being smarter means having less of an impact on the environment? There are a whole lot of very smart people who do un-environmentally friendly things. And this brings us to the last modification that Liao talks about: empathy. You might remember that just a few weeks ago we talked about empathy on this very podcast! And you might remember that empathy is actually a really hard thing to define. Liao’s idea is to give hormones like oxytocin and seratonin to people, and to perhaps decrease someone’s testosterone. But those hormones have all kinds of effects, and can change people in really profound ways beyond making them a little more amenable to negotiating. So there are a few problems with these specific proposals. But Liao says that these were just meant to be thought experiments, ideas put out there so that other people can run with them. So let’s back up and talk about this idea more broadly — the idea that we should genetically engineer, or breed ourselves to be better. Which sounds like a great idea, and is also the same language that was used at the beginning of the eugenics movement. As usual, this is just a summary of what we talk about on the podcast. To hear more from Liao and Maxmen, have a listen.